Many years ago, it is said, that elephants had small trunks with stubbed noses. One year, it did not rain for many months. The ponds and lakes began to dry up, and the streams had very little water. All the animals in the forest were very thirsty, and desperately searching for a source of water. A river used to flow not very far away from the forest, and an elephant decided to go there in search of water. Walking slowly, he reached the river. There lived a bright green crocodile in the river. As he saw the elephant, he cried, "Go away! Water is already scarce here. If you start drinking, what will be left for me?" The elephant knew it was a risk to pick a fight with the crocodile. So, he decided to come back to the river when the crocodile would be sleeping. In the same river, there also lived a shiny green toad. Whenever the crocodile would be swimming across the river, the toad would hop onto his back and enjoy a ride. Over time, the crocodile was annoyed with giving free rides to the toad. Many times, he had tried to shake the toad off his back, but in vain. "Hahaha!" the toad would laugh. One day, the crocodile was resting on a rock. Finding this to be a good opportunity, the elephant went to the river silently and began to drink water. Just then, the toad jumped onto the crocodile's back, disturbing his slumber. The crocodile was irritated! He began to swim around the river and shake his body violently. "Now, I shall get rid of you!" he cried at the toad. But, the toad was unmoved. Suddenly, the crocodile noticed the elephant. "How dare you drink from my river when you ​ were told​ not to?" he cried. 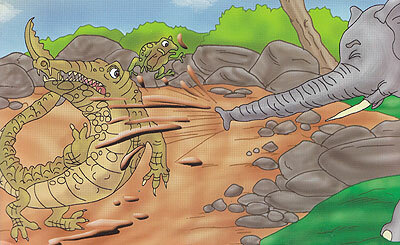 Unable to get rid of the toad, the crocodile decided to vent all his anger on the elephant. He caught the elephant's trunk and began to pull him into the river. The poor elephant started to pull back, crying, "Let go of me....please! Let go of me....my nose hurts!" But the crocodile showed no mercy. Then, with a mighty jerk, the elephant succeeded in freeing his trunk from the crocodile. But, in tug of war, the elephant's nose had become really long! Angry, the elephant sucked all the water from the river. Then, he sucked some mud and sprayed it on the crocodile and the toad. Since then, it is said, elephants have had long trunks, and crocodiles and toads are not bright green anymore.